Sorry guys. I know I haven't really been keeping up with my blogging game like I should. My knitting has been hot and cold. Some day's I'm hot like fiya and other days I'm as cold as a clam but I just wanted to give a shout out to a very good and very talented friend of mine. She's doin' it up real big and I'm so proud. Please take a look at her website (there's a link in my sidebar) and her blog is listed bellow. I'll have a post soon with some progress soon. Keep those sticks clickin'! Does anyone have the number to Stashbusters???? 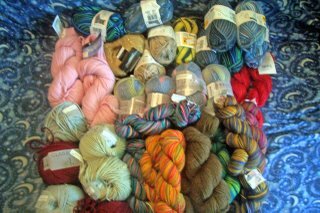 So, I bet your wondering if I went to the yarn sale I previously posted about? Do you even have to ask? Hell yeah! and 4 skeins of Nashua Handknits Wooly Stripes. I also picked up some Addi Turbo Circular knitting needles in various lengths and sizes, bamboo double pointeds, a pom pon maker and a knitting knobby. Although the original prices are kinda high, everything in the store was half price. I couldn't resist! So, I ask again, does anyone know the number to stash busters? Besides the stash enhancment, I've been knitting like crazy. A little while back, I don't know any other way to explain it but it felt like I lost my knitting mojo. I would pick up a project and would only knit a couple of rows and be compelled to put it down. I just couldn't get motivated to knit anything. It almost felt like a chore (perish the thought) and it made me doubt my knitting devotion. I prayed that the feeling would pass and alas it has. 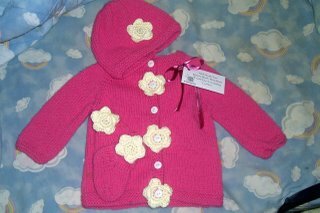 So, I finished the pink baby set that I was working on for my cousin. I used the dreaded LB Pound of Love that I spoke of a while ago. I love the little crocheted flowers on the buttonholes. 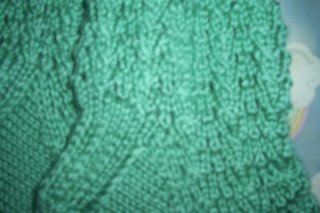 That was my favorite part of the sweater. I also started on another one using Caron Simply Soft in peach. 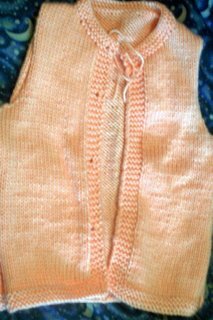 This time I'm making the cardigan in pieces and seaming them together. Ususally I wait until I've finished knitting everything to weave in the ends and seam it up, but I've learned my lesson. I finished the socks for my grandmother two days before Mothers Day. I was planning on using the Koigu yarn that I had but it just wasn't working out and I was running out of time. So I ended up turning to the ever dependable Caron Simply Soft. I used a simple lace patern out of one of my stitch dictionaries. Of course I can't think of the name of the book or stitch right now but I really like the way this stich looked so I might have to go diggin'. Please forgive me for the horrible pics. I'm also working on an Ipod cover for my Boo's new Nano. Gives me a reason to use some of the sock yarn I have. Yep, just like most knitters I'm always looking for ways to legitemize my over indulgence in the art. Before I go I just want to express how excited I am over the Sistah Friends Knitting Secret Exchange. (commence sappy background music)Two years ago I would have never thought that I would be knitting or let alone blogging like this and just being a part of the knitting community makes me feel special (end music). This will be my first time participating in an exchange and I can't wait to get started. Yeeaaaah! I also dyed some yarn. 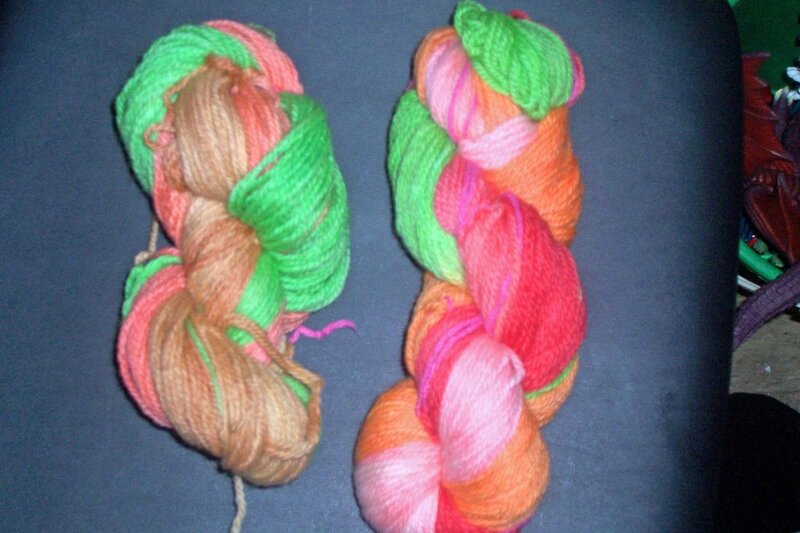 The one on the right was dip dyed using kool a de and the one on the left was dyed using Wiltons Icing . I like the way the kool aid yarn came out but I'm not too happy about the Wiltons. I'm willing to admit that I do not have a knack for matching colors. My friend Kim is a wiz at that kind of stuff but unfortunately I did not consult her prior to choosing my colors. I also noticed that the Wilton dyed yarn doesn's seem to "pop" like the kool ade yarn. They seem a little more muted. Well, at least now I know for future refence.Of course I'm going to use the yarn for som thing but it just may take me awhile to think of what that is. On my way home from work this afternoon, something compelled me to visit one of my LYS. My first and last visit to the Lion and the Lamb was over a year ago and I didn't go back due to a very "snoberish" vibe I got while I was there. I wanted to get some size 7 double pointed needles becaause I'm working on some socks and the magic loop method just aint working for me. I usually get the "cost efficient" Boye metal ones but something said "why not get some bamboos", hence my detour to this yarn shop. East Lexington Avenue between 95th and 94th Streets. By train, take the 6 to 96th street, go up the South West exit and walk 2 and a half blocks south. I'm so excited I may run there during my lunch. I just had to look out for all my fellow fiber enthusiast. Happy knitting! I guess I'm feeling kinda froggy. 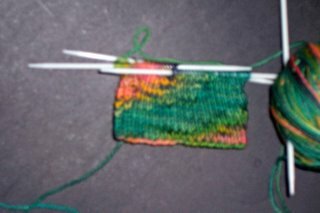 Over the weekend I started a pair of socks as a mothers day gift and it's just not coming along to my liking. 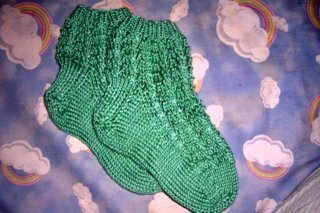 As mentioned previously, I wanted to make the Pomatomus socks using the Koigu yarn I recently purchased. My intentions were good, but I may have been a tiny bit overzealous in my planning. To say the least, this pattern is hard. Let me rephrase that, this pattern is not hard, it's just very time consuming and requires a lot of attention to detail. Just thinking about those "k2tog tbl" makes my fingers cramp. Oh well, I'll frog it and start from scratch. I'm usually not a frogger but that Koigu yarn is so darn cute (and expensive) that I just can't see it going to waste. Most likely I'll try and design something because I really want this gift to be extra special. Any hoo, here's a picture of the "Po" before I rip it good. Sorry for the horrible picture but my Kodak doesn't seem to want to be my friend right now. So, back to the drawing board....I guess it's stich dictionary to the rescue. P.S. 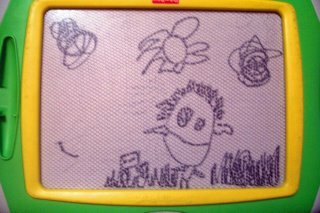 Just because he asked me to, here's a picture my four year old drew on his Doodle Pro writing board. By the way, it's a picture of me.